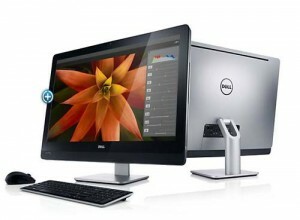 At IFA 2012, Dell Computer has introduced its new “All In One”, the Dell XPS One 27 AIO, which includes all the components on the monitor and gives an evolutionary leap to include a touch screen that will bring full advantage of Windows 8. The screen on this impressive Dell XPS One 27 AIO offers a resolution of 2,560 × 1,440 pixels, and use a base that allows tilting at will even leaving completely horizontal to make it a “touch table” which reminds me of the original Microsoft Surface devices. Obviously in this scenario is that the integration of Windows 8 will give its full potential in a very prepared to take advantage of touch applications and games. We find this all-in-one with multiple processors (Intel Core i5 and i7 at various frequencies) that can combine with NVIDIA dedicated graphics cards if you do not want to settle for the integrated Intel HD 4000 GPU. In addition we can integrate up to 16 Gbytes in the more advanced configuration model, 2 Tbytes of storage capacity and mSATA SSD to improve boot and application. Prices are expected to build on the $ 1,399 for Dell XPS One 27 AIO, as it starred its predecessor, which was based on Windows 7.